Nina Dobrev speaks on stage at the 2016 GLSEN Respect Awards held at the Beverly Wilshire Four Seasons Hotel on Friday night (October 21) in Beverly Hills, Calif. The 27-year-old actress dolled up for the event to honor YouTube star and activist Connor Franta. “Connor Franta has carried the message of respect to millions of young people online, and his authentic self-expression is the type that we envision for all of the youth we serve,” GLSEN executive director Eliza Byard said in a statement. 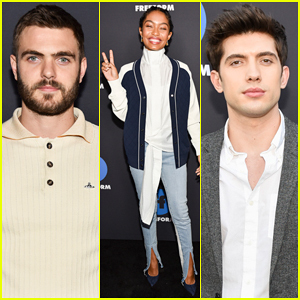 Hairspray Live actors Ephraim Sykes, Maddie Baillio, and Garrett Clayton joined in ont he event alongside Freeform stars Chelsea Kane, and Hayden Byerly and his girlfriend Alyssa Jirrels. Charlie Carver, and JJ Totah were also spotted at the event. FYI: Nina wore an Armani dress, Jerome C. Rousseau shoes and a Tyler Ellis clutch. Hayden Byerly and Gavin MacIntosh pose for photos while attending Just Jared Jr.’s Celebration of Disney’s MXYZ Collection on Friday (June 10) at Neuehouse Hollywood in Los Angeles. The guys, who played a couple on Freeform’s The Fosters, were joined at the event by their respective girlfriends, Alyssa Jirrels and Brooke Sorensen. Also in attendance at the event were Lab Rats: Elite Force cast members Jake Short, Bradley Steven Perry, and Paris Berelc, who met up with their pal Austin North. 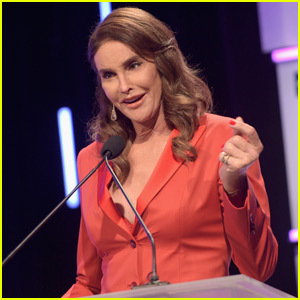 Caitlyn Jenner is gorgeous in red while speaking on stage during the Point Foundation’s 2015 Voices On Point Gala held at the Hyatt Regency Century Plaza on Saturday (October 3) in Los Angeles. The 65-year-old reality star and activist was joined at the event by several members of The Fosters cast, including Hayden Byerly, Teri Polo, Sherri Saum, and Gavin MacIntosh. “It was my privilege to present the @PointFoundation #HorizonAward to @ZachZyskowski and @RhysErnst at #VoicesOnPoint last night. A big congrats to them and to all Point Scholars doing amazing work in the #LGBTQ community and the world,” Caitlyn wrote on Instagram. FYI: Caitlyn is wearing a custom-made Anthony Franco suit.